January 9th, 2017 was cold. The ground was covered with snow and ice. "No one is going to come out in this weather," we worried. But--literature lovers of Montclair, we shouldn't have doubted you. Not only did people come out to the Red Eye Cafe, but the audience was our biggest yet! 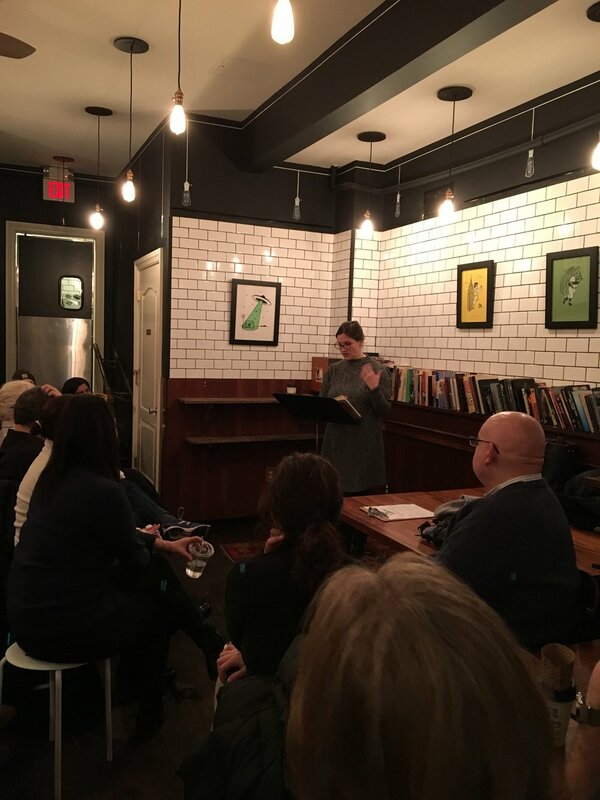 More than fifty people, including a growing community of past and future readers, joined us for an evening of the kind of warmth that only coffee and literary camaraderie can provide. 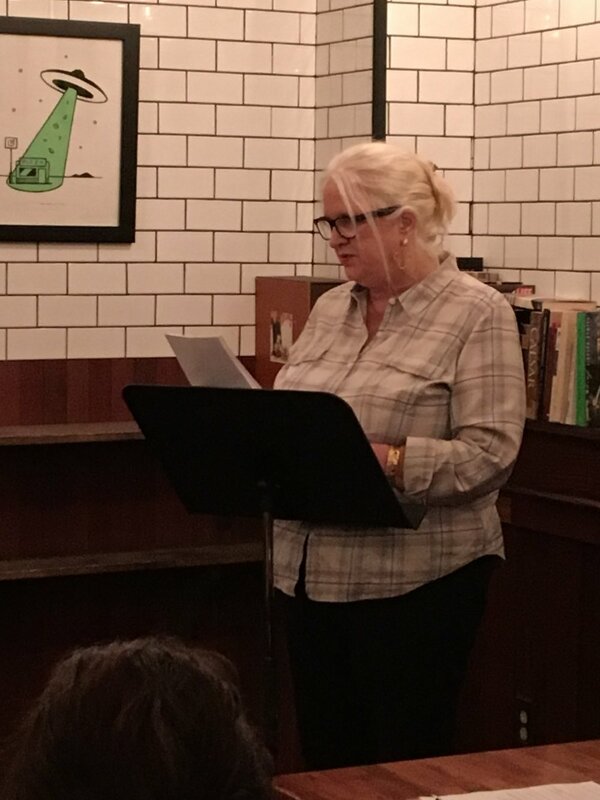 Host and series co-founder Apryl Lee welcomed everyone back for our first reading of the new year and introduced Alice Elliott Dark, who read from her novel-in-progress We All Fall Down, which she explained is like a 19th century novel where the women own the property. The audience was rapt and despite the perfect last line she ended her reading on, was dying for more. Hopefully we won't have to wait too long before we can all get our hands on the finished book. Elisabeth Egan read next, also debuting an excerpt from a novel-in-progress. 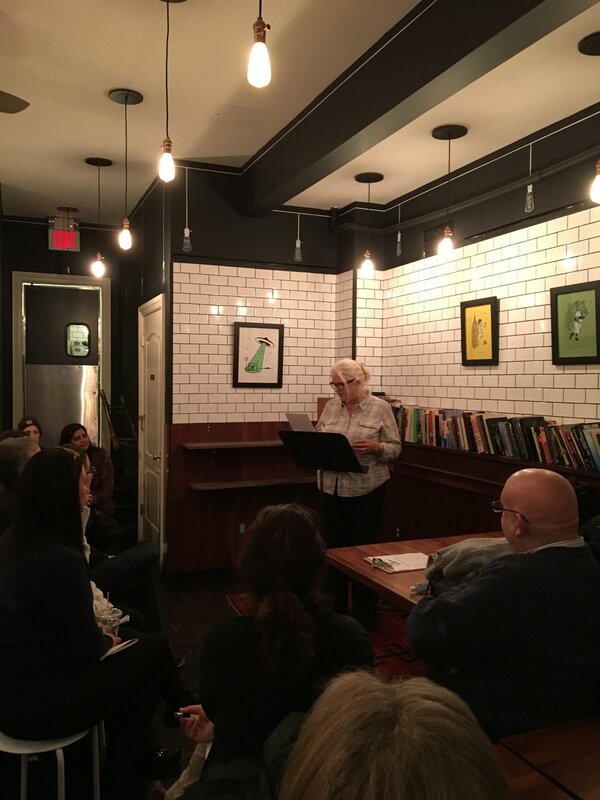 She shared a passage from the beginning of the book about friendship and the ubiquitousness of the name Jennifer in the 1980s that had the audience applauding with recognition and then concluded with a portion of the story chosen specifically to cater to the New Jersey bent of Halfway There. While she introduced it with an anecdote about a phase of home-state disavowal that many New Jersey natives go through, which she termed "New Jersey Rumspringa," this chapter described a specific slice of the Jersey Shore in a way that was both honest and rapturous. Elizabeth Onusko shared a selection of poetry from her collection Portrait of the Future with Trapdoor. Later, she described the thematic through-line of her book as what happens when "the body and society turn against themselves." At times funny, at times devastating, her words were provocative and beautiful. She, too, concluded with a new and as-yet-unpublished work. 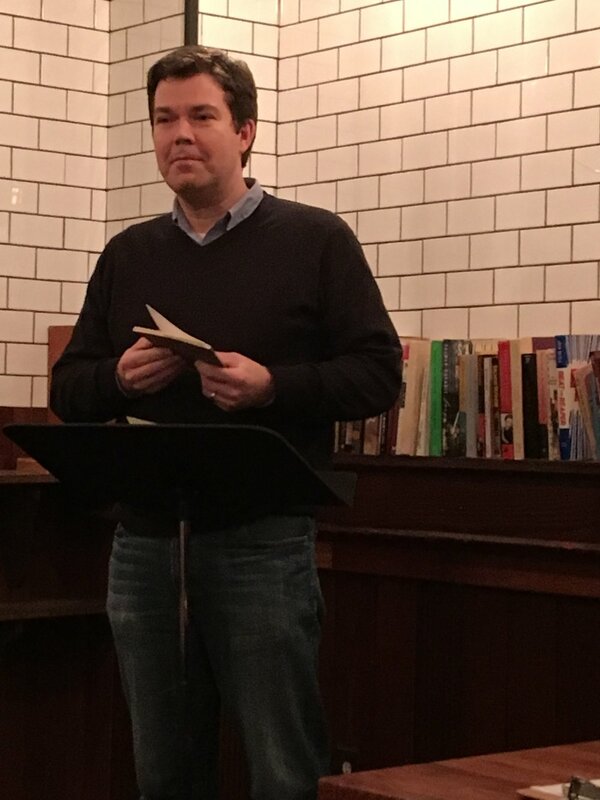 The last reader of the evening was Matthew Thorburn, who read from his book-length poem Dear Almost. Addressed to a child lost to miscarriage, Thorburn said a central question of the book is, "How do you mourn someone you were never able to know?" Organized around the passing of the seasons, he read a series of meditative, moving selections from Spring and Autumn. Highlights of the audience Q&A that followed the readings included Elizabeth Onusko quipping, when asked how the writers began writing, that they all did it for the money, and one of Alice Elliott Dark's students asking, "I'm wondering if Alice can speak to how her Rutgers students inspire her?" "From dawn until dusk!" she responded. Book-buying, book-signing, and mingling lasted until the last possible second. We can't wait for our next event!